Hi, welcome to the Safari suit website. The Safari Suit is designed for fashion and function. Not only is it a joy to wear but very versatile. 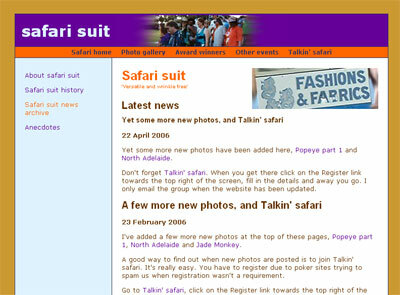 This website originated because a group of friends have been getting together every year to celebrate the safari suit and dress up in safari suits and other 1970’s fashion including accessories. We celebrate by visiting various establishments around Adelaide. Our aim has been, and continues to be, to celebrate the safari suit in all its glory – world wide – so if you wear one please let us know by sending a photo and your safari suit story and we’ll post it on this site. The safari suit can be worn anywhere from the steaming hot jungle of the Congo to the fashionably cool urban jungle. 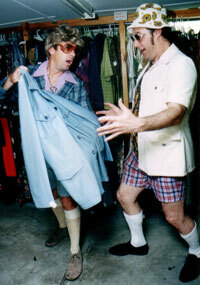 The Go-Anywhere safari suit will allow entry into the grungiest pit or the swishiest nightclub or casino. Totally fashionable, totally drip dry, with it’s practicability of a multiple choice of pockets that could house the form guide and winning tickets out on the track, or important accessories such as sequined sunnies and frizz comb out on the town. It is a real winner with the ladies also. The ladies are not left out, however, as you will see in the photos and award winners pages. You can also read all about the Safari suit pub crawl history. Feel free to comment on the blog or contact us. Thank you very much for a most entertaining chuckle!!!!! where can i buy one in australia??? I gather you mean where can you buy a safari suit in Australia? I’d look either on ebay or in op shops. As they’re gaining popularity it’s harder to find them these days but if you’re vigilant enough you will find something. Dear Safari suit website creator. Any chance you might know the true origin of the safari suit? I would really like to know how it came to be and all that. I live in India and it was an incredibly popular outfit for men in India in the 70’s, 80’s and 90’s. You can still see men wearing The suit from time to time. It’s nice to know that the dear old safari suit (in the late 70s up until the mid 80s, they were affectionately known in my country as the “bush jacket” or “jungle tops/jungle trousers”) is again gaining popularity, albeit rather slowly. In the Philippines, the safari suit was very popular for 2 decades, from 1968 to 1988. A lot of kinds of men wore them, from then President Ferdinand Marcos (he had, other than his “barong tagalogs”, an eclectic line-up of belted safari suits featuring “three-fourth quarters” shirt sleeves) to captains of industry to various TV personalities to security personnel. Kudos and more power to the people behind safarisuit.com! Hey buddy. Are you still out there. I have lots of safari suit photos. We need to talk.